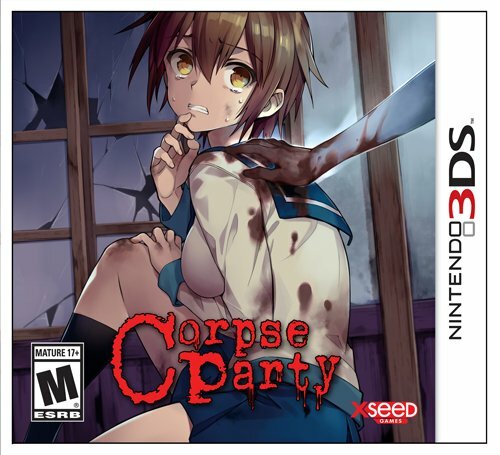 XSEED Games, Marvelous USA Inc.
Corpse Party for the 3DS is the newest edition of Corpse Party. This version of the game is a spruced up port of the PSP and iOS remake. What started out as a little RPG Maker game has now made its way here. 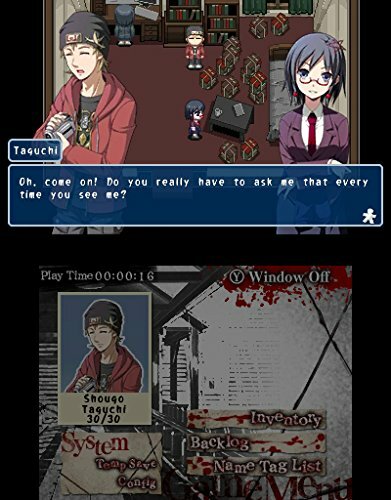 Changes from the PSP/iOS version include re-done character graphics, remixed music, some new bad endings and a few extra chapters. 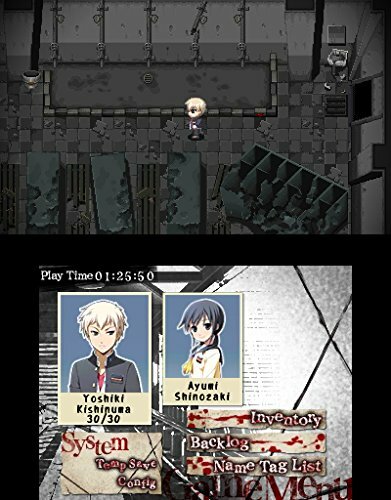 Corpse Party starts out with some high school kids hanging out after class, with one student telling a ghost story. One of the students is going to be transferring to a different school and this is their last day here. Another student has the idea to perform a little ritual that would ensure they would all stay friends forever. After performing said ritual, a massive earthquake happens, the floor of the classroom gives way and everyone falls into a hole. They then find themselves in an old school that is haunted by not very friendly spirits. It’s up to you then to figure out what’s going on and hopefully escape. Corpse Party is broken down into 5 separate chapters, each one typically focusing on different characters. There’s one correct ending and multiple wrong endings for each chapter. Failing to accomplish a particular goal or dying in various circumstances earns one of the wrong endings. The story in this game is presented very well. The mystery of the school slowly unfolds as you discover more things about the spirits that haunt it. There’s also a twist or two along the way to spice things up. For most of the game though, it spends more time on character interactions. Each character has a distinct personality, and they all respond to things in realistic ways. They might be fairly typical archetypes that some folks are used to, but they’re written pretty well. I only found one character to be particularly grating, a rather spoiled little girl, so I think maybe that feeling is intended. There’s also extra chapters which are short side stories that flesh out the characters and world even more. They also contain no gameplay whatsoever; it’s all just reading text. Corpse Party’s gameplay is nothing complex. You simply interact with items in the environment; there’s no combat here. The most you’ll be doing is puzzle solving. This mostly boils down to finding an object to use on a specific thing to progress. There are moments in the game where you’re being chased and the objective there is to simply run away. You do have health, though this isn’t used too much. Most of the time, if you get caught by something, it’s an instant death. The gameplay is really not the highlight. 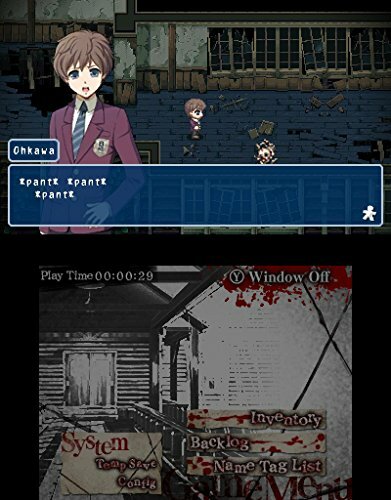 Most of your time with Corpse Party will be spent exploring and trying to figure out what to do, with the overarching objective being simply to escape from the school. At the very least, this avoids some things that plague a lot of horror games. There’s no bad or janky combat, and there aren’t any unfair deaths either. I do wish the puzzles in this game were a bit more complex, however. Most of the time, it’s just finding a key to unlock a door. This game definitely puts its emphasis on story, characters and atmosphere. Corpse Party succeeds very well at creating a haunting, and at some points oppressive, atmosphere. The school looks run-down and decrepit. Torn up walls and floors, smashed windows, and all sorts of things broken and strewn about. Massive holes in the floor really make it feel like this place is just barely holding together. The color palette makes the school look very old and drab. Scattered all around the school are the bodies of other dead students. It’s an always present reminder that you, too, could be next. Really, it’s a perfect setting for prime horror material. A visual aspect the game likes to use is a fuzzy black border around the screen. This is used many times to restrict the players’ vision to a certain degree. The sound design is excellent as well. The soundtrack does a very good job of setting the mood. Whether you’re just looking around and exploring or in somewhat more tense circumstances, there’s music that perfectly fits it. There are also little sound effects like creaking floor boards or rattling windows that make the world seem just a bit more real. Last is the flavor text which is the cherry on top here. With the elements I’ve talked about here, the atmosphere would be just “good”, but the flavor text pushes it beyond. If you press A to examine certain things in the game world, you’ll get a little description of what the item is. Sometimes it’s innocuous, sometimes it’s less so. I won’t spoil any of them, but they give you just enough information to paint a vivid picture in your head while also letting your imagination fill in details. The voice acting also helps sell this game’s suspense, as well as just being good voice acting. The voices are Japanese only, but their emotions are still very recognizable. If a character goes insane, they definitely sound the part. If a character is suffering some horrible death and they’re letting out a guttural, inhuman scream, you get that too. The voice acting adds a layer of realism to the game that makes the events have more impact. The writing can definitely stand on its own, but the voice acting just gives it that little boost. Overall, the atmosphere in this game is disturbing, unsettling, and just excellent. It’s easily one of the big highlights of Corpse Party. Atmosphere is always important in horror games, and this game succeeds. There are a few minor technical flaws, however. If you want to see the different endings, you need to replay the chapter. While you can fast-forward through text, you can’t skip any scenes outright. This can make getting the different endings rather tedious. If you die, you have to sit through the ending scene as well. There’s no way to skip it or exit to the main menu. All of the game menus for activities such as accessing your inventory are controlled solely with the touch screen, whereas most 3DS games have the option of using normal buttons instead. 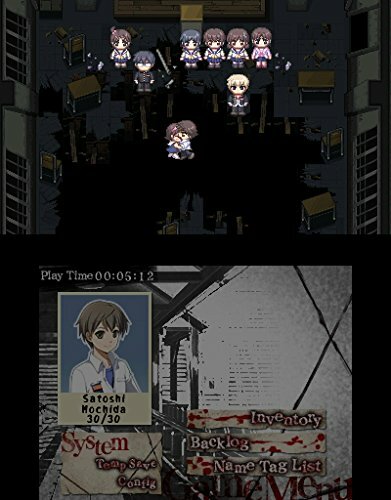 Corpse Party doesn’t use the Start, Select, L, R, or Y buttons at all, so it’s a bit baffling to me why they didn’t have this simple functionality. You’ll also find yourself exploring a lot of the same areas over and over again in each chapter. Corpse Party has a built in justification for this, but you’re still gonna go over the same zones quite a lot. From Chapter 3 on, you start exploring other areas. Considering this is a remake of an indie RPG Maker game from 1996, I’m willing to let this sort of thing slide. Something to keep in mind is that the’ Back to School Edition’ is the only way to get this game physically, and it will cost you $50. You can get it for just $30 on the eShop, though. That puts it $10 above the PSP/iOS versions, which is a bit more fair. The extra $20 for the physical version just gets you a couple figures and a soundtrack. Still, Corpse Party is a pretty great horror game with an amazing atmosphere and an intriguing story. If you’ve never played this before and are looking for some good spooks on your 3DS, this will satisfy you assuming you’re okay with the price tag. If you’re a veteran wondering if they should double-dip, I’d keep in mind that the overall story is exactly the same. There aren’t a whole lot of new things. However, it’s currently the only way to get a physical English version of the game, so that’s worth something.